I'm doing well so far with my goal to make time for what I love this year. I enjoy the quiet rhythm of hand quilting in the evenings, but in the last year I have let that pleasure slide to the bottom of my "to do" list. Not anymore! I am making a conscious effort to stop whatever I'm doing about an hour before bedtime and sit with my quilting. This quilt top was finished last February. 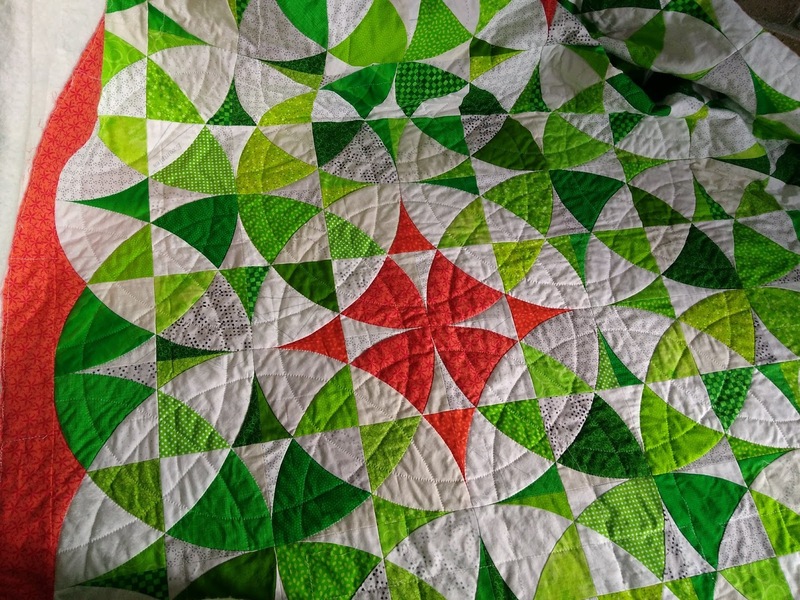 I finally decided how to quilt it in early spring, discovered my arms were not long enough to quilt with at the distance my eyes could focus, finally gave in and got progressive lenses for my glasses and promptly decided it was too hot to sit with a quilt in my lap during the summer. I don't know what my excuse was for neglecting this quilt in the fall, but I finally started working on it again and I can finally see the larger design starting to emerge. I really am enjoying my evening quilting sessions. It surprises me (though perhaps it shouldn't) how tuning out everything else for a little bit of quiet time before bed is helping me fall asleep more easily. Just in case I start getting discouraged at the pace of my progress, I have printed out a line drawing of the quilt and am colouring it as the quilt gets quilted. That was motivating and encouraging when I quilted Whimsy and my son's kaleidoscope (still unnamed!) quilt. Here's the progress so far. If I commit to an average of quilting half a block each day, I can have this done before summer. Let's see how I do! I missed one day already in favour of family time, but that's certainly a valid excuse, well in line with good mental health goals! This is looking great! I read just before bed which helps with sleeping. I can see how hand quilting would be the same. Your quilting is beautiful. I enjoy hand quilting my projects as well and sometimes I just encourage myself to do a length of thread per day.. Seems like a great plan to me, and your hand quilting is as beautiful as the quilt top! ---"Love"
What a great goal. Family time is a good excuse for putting off the quilting time. So happy to see this quilt under the needle. The pattern and colors are beautiful and this hand quilting plan is stunning! Oh, my goodness, it’s beautiful! I’m winding down most evenings with a knitting project for something a little different. 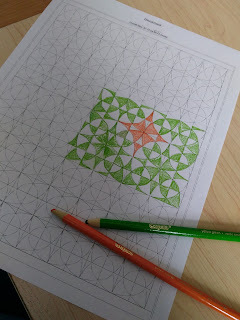 Once I get the rythym of the pattern down, it will make a good 'to go' project for my next road trip. That will be quite a treasure! Keep at it. What a great idea to motivate yourself by coloring in the completed areas! The quilt is beautiful! It looks fabulous... love the texture and added dimension to the lovely quilt! 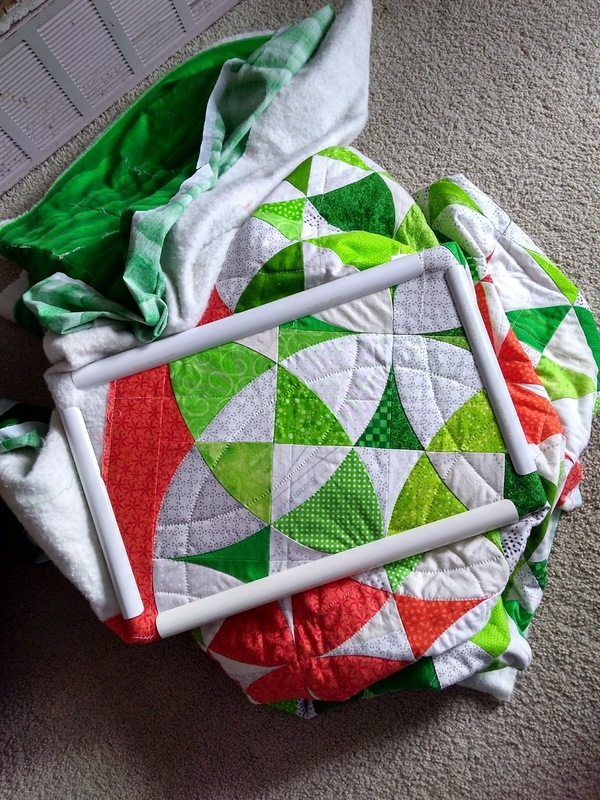 Love the photo of your quilt in the hoop! Great job! I love the design, and your quilting! I need you to come sit by me and make me work on my quilt in the hoop. 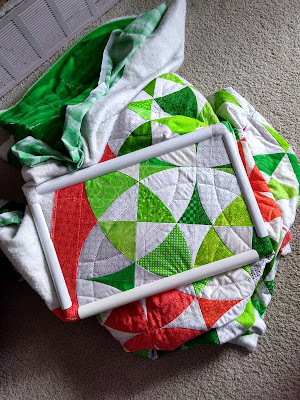 There are just always so many other things that "need" doing, so this quilt has been in the hoop over a year with almost no progress. Bad quilter! Love seeing this beauty again, and your beautiful hand quilting. Glad it's helping you sleep too. I always read for 15 min or so before bed. Making time for yourself is a wonderful resolution and doubly so because you are seeing great progress on your quilting. Love the colours you chose! I’m in awe of you who hand quilt. This is a stunning quilt (love the colour combo) and the quilting pattern. Your quilt is so pretty! I need to make sure that I schedule time for hand quilting each day as well.